The following are the latest results contributed by HM Courts Service, for cases sentenced by West Sussex Magistrates’ Court sitting at Worthing from March 15 to 22. Emily Colbourne, 36, of Queen Street, Littlehampton, was discharged conditionally for eight months and must pay £50 compensation after admitting assault by beating in Worthing on December 29, 2017. Stephen Grassie, 55, of Arundel Road, Littlehampton, was given a community order and must carry out 250 hours’ unpaid work after being found guilty of driving a Ford Ranger dangerously on the A27 Worthing on July 1, 2017. He must pay £85 victim surcharge, £625 costs, and was disqualified from driving for 24 months. Iain Cantello, 35, c/o Oriental Place, Brighton, was given a community order with Rehabilitation Activity Requirement and must pay £85 victim surcharge, £85 costs, after admitting stealing six bottles of spirits worth £108 from Morrisons, Worthing, on March 1, 2018. Valdas Macelis, 63, of Meadway Court, The Boulevard, Worthing, was given a community order and must carry out 120 hours’ unpaid work after admitting failing to provide a specimen of breath for analysis when required at Chichester Custody Suite on February 13, 2018. He must pay £85 victim surcharge, £85 costs, and was disqualified from driving for 30 months. Brett Austin, 36, of Hadley Avenue, Broadwater, was given a community order with Rehabilitation Activity Requirement after admitting two charges of assault by beating in Worthing on August 21, 2017. He was also given a restraining order and must pay £85 victim surcharge, £85 costs. He also admitted driving without due care and attention in Raleigh Way, Worthing, on October 13, 2017, and his driving record was endorsed with six points, no separate penalty. Simon Cole, 52, of Foxes Croft, Barnham, was given a community order with Rehabilitation Activity Requirement and must pay £85 victim surcharge, £200 costs, after admitting assault by beating in Barnham on June 11, 2017. He was fined £120 after admitting resisting a police constable in the execution of his duty in Barnham on June 11, 2017. Danny Dias, 57, of Linfield Copse, Thakeham, was given a community order and must carry out 240 hours’ unpaid work after admitting wilful neglect under the Mental Capacity Act on April 26, 2017. He must pay £85 victim surcharge, £400 costs. Wyn Ellis, 57, of St Mary’s Close, Littlehampton, was given a community order with Rehabilitation Activity Requirement and must carry out 140 hours’ unpaid work after being found guilty of wilful neglect under the Mental Capacity Act on April 26, 2017. She must pay must pay £85 victim surcharge, £620 costs. Connor Heather, 19, of Ringmer Road, Tarring, was given a community order and must carry out 60 hours’ unpaid work after admitting using threatening, abusive or insulting words or behaviour with intent to suggest unlawful violence would be used or provoke unlawful violence in East Preston on May 20, 2017. He must pay £85 victim surcharge, £85 costs. Michael Pegg, 56, of Brighton Road, Worthing, was discharged conditionally for 18 months after being found guilty of assault by beating in Lancing on November 5, 2017. He was also given a restraining order and must pay £100 compensation, £100 costs. Tyler Allen, 18, of Arundel Road, Angmering, was fined £40 and must pay £30 victim surcharge after admitting being the registered owner of a vehicle which did not meet insurance requirements in Littlehampton on July 14, 2017. Keith Penfold, 38, of Magnus Place, Ropetackle, Shoreham, was fined £307 and must pay £93.75 vehicle excise back duty after admitting keeping an unlicensed vehicle on a public road in Brighton on December 9, 2013. 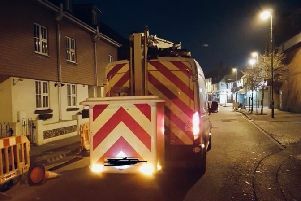 Mantas Scerbavicius, 31, of Sheldon Court, Bath Road, Worthing, was fined £100 and must pay £30 vehicle excise back duty, £60 costs, after admitting keeping an unlicensed vehicle on a public road in Worthing on March 31, 2016. Camellia Turnmer, 43, of Berry Court, Mosse Gardens, Chichester, was fined £145 and must pay £30 victim surcharge after admitting driving over the 30mph speed limit in Broadwater Road, Worthing, on April 28, 2017. Her driving record was endorsed with three points. Benjamin Dean, 25, of Cavendish Close, Goring, was given a community order and must carry out 120 hours’ unpaid work after admitting stealing a defibrillator, can of Fabreze and hi-vis vest worth £1,050 from Southern Railway at Lancing on November 4, 2017; and damaging a defibrillator, three windows, a side gate lock and screen worth a total of £2,497.64 in Lancing on November 4, 2017. He must pay £85 costs, £2,497.64 compensation. Ryan Moore, 30, of Grafton Gardens, Sompting, was fined £436 and must pay £43 victim surcharge, £85 costs, after admitting drug-driving (79ug/l cocaine) in Littlehampton Road, Worthing, on December 17, 2017. He was disqualified from driving for 12 months. He was fined £436 after admitting driving without insurance. He also admitted drug-driving (>800ug/l benzoylecgonine) and drug-driving (9ug/l Delta-9-THC) in Littlehampton Road, Worthing, on December 17, 2017, no separate penalties. Tyron Rogerson, 32, of Gardner Street, Fishersgate, was given a community order with Building Better Relationships programme requirement and Rehabilitation Activity Requirement after admitting damaging a bathroom door and vehicle bonnet in Worthing on December 1, 2017. He was also given a restraining order and must pay £200 compensation, £85 victim surcharge, £85 costs. He also admitted breaching a community order, which was revoked and he was given a new community order for the original offences of assault by beating in Worthing on August 1, 2016, and using threatening words or behaviour with intent to cause distress in Worthing on August 1, 2016. Barry Salter, 48, of Adur Valley Court, Towers Road, Upper Beeding, was fined £270, given a community order and must carry out 80 hours’ unpaid work after admitting driving while disqualified on the A283 Shoreham on February 22, 2018. He must pay £85 victim surcharge, £85 costs. He was fined £270 after admitting driving without insurance. He also admitted failing to give his name and address when required by a police constable, and driving a vehicle without an MOT certificate, no separate penalties.